This was an impulse buy for me. Loot Crate ($13.95/mo +$6 shipping in the US) is a geeky-themed box with 6-8 products. I’ve actually previously avoided this subscription because I feel like these tend to assume that you’re geeky for everything. I don’t like the idea that I’d be getting products for fandoms that I don’t remotely want to be a part of (cough cough Dr. Who/Adventure TIme). When I found out this box theme was Villains and the spoilers included The Joker, I was curious. When I found out another product was Breaking Bad? I was in! 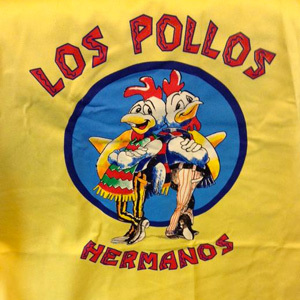 Los Pollos Hermanos Apron ($25) – Duuuuude. This apron is a bit on the thin side and the screen print isn’t great, but it has pockets! The Joker Wooden Figurine ($13) – This was a Loot Crate exclusive version of this figure. Here’s a similar Batman one. They’re made in a really interesting style with heads, arms and legs that can be swapped with others from the series. Carnage 3D Mug ($10) – My boyfriend was so excited about this one! This is a huge mug, but Carnage definitely strikes an imposing figure. Other boxes got Venom, and I’ll admit I’m a little jealous. Captain America Hydra Pin ($20) – I’m not a big Avengers fan, but I like that this pin could pass as piratey. It’s nice and heavy with two pins on the back for stability, so cool! Loot Crate Mini Magazine and Venom Pin – Nice little bonuses! The Overall? – I was hugely impressed with the packaging! The shipping box is plain black, but the inside is printed to match the theme, and it’s made to refold so you can use it as a display. This month, it was The Joker and Harley Quinn making mischief in their sewer lair! I wasn’t a huge geek for all the fandoms represented, but every item was claimed by somebody in our household, so that’s great! The value is super and it feels like a good value. I never thought I’d say this but: this is a box I can’t get behind. I did just sign up for The Soap Box though! It says I’m signed up for the Winter Box. I hope that’s the one coming in November!